As you work, run errands, and overcome obstacles in your everyday rigmarole, you build up stress. That means mental stress, as well as physical stress. Your mind may be tired, or you may become irritable or depressed due to stress. Meanwhile, your muscles can tense up and form knots. Breathing breaks that pattern. The deep breathing practice incorporated in yoga can boost your mood and turn off mental stress. Deep breathing also relaxes the muscles. That can provide further relief from life’s stressors. 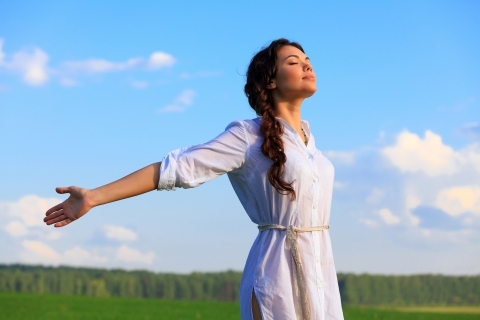 Believe it or not, deep breathing aids in detoxification. Our body relies on the lymphatic system to filter out toxins. However, the lymphatic system is rather passive, and it relies on movement to get toxins flowing out of the body. Deep breath, as well as yoga movements, can help your body to detoxify. Deep breathing causes pain relief! Think about a time when your muscles were sore and you took a moment to stretch and “breathe through the pain.” While you breath through the pain, you’re filling your lungs with oxygen. This oxygen seeps into your bloodstream, and it pumps throughout the body. This oxygenated blood feeds your muscles and your brain. That means faster muscle repair, and it can trigger the brain to release endorphins, a natural painkiller. That’s pain relief that’s doubly effective. So if you’re in pain, if you’re ready to rid your body of toxins, and you’re ecstatic to overcome stress, deep breathing and yoga are the perfect solutions. If you’re ready to begin, get started by signing up for a class, or get in touch with us at (901) 201-5999.